A blog about hats and horses and so much more! On Derby Day, It’s STILL All about the HAT! Well it’s almost a year to the DAY that I posted this blog about choosing the perfect Derby chapeau. I hope you enjoy it again as we celebrate the debuts this coming week of some of our NEW 2014 Derby chapeaux! Every Derby season people ask me, Which comes first, the hat or the dress? As a custom milliner that specializes in fancy Derby chapeaux my response to this chicken-or-the-egg question has always been the same. On Derby Day, it’s all about the hat. Creating a Derby day outfit is like preparing a delicious feast for some grand celebration. The hat is the main course; the dress, shoes and purse are the side dishes that complement it. If you prefer to find your Derby hat first, you may discover that the dress, the shoes and the purse will be easier to find because you have already established the main course. However, if you feel more comfortable first looking for your dress, the guiding principle is still the same, On Derby Day, it’s all about the hat. Even as you shop for a great Derby dress, never let the concept of the hat out of your mind. Keep visualizing the hat as the main course in your grand feast. Here at MAGGIE MAE DESIGNS® there are no hard-and-fast rules as to which comes first. I personally welcome both the hat-first and the dress-first Derby shopper as each offers the possibility of a very different millinery adventure. The beauty of a custom millinery like mine is that I can create an existing hat from my online Derby Hat Collection or, I can create a unique one-of-a-kind hat in a style, color and fabric to match an outfit. In fact some of my most memorable Derby hat adventures have occurred when customers have come to me with everything but the hat. Together, we created a chapeau that transformed the elements of their outfit into a cohesive whole with the hat as the central theme. 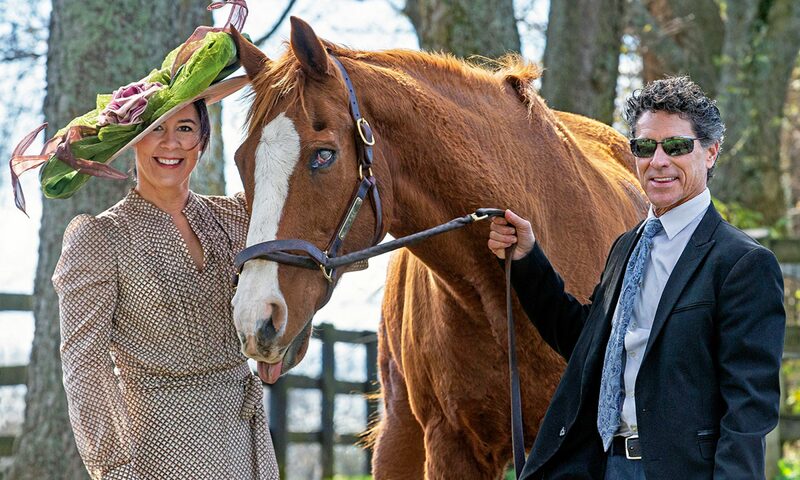 Whether you begin your Derby attire search with the hat or the dress, there is one very important suggestion I would make: Get started early. You will save yourself much heartache and expense if you start planning and shopping ahead. Derby hats can take between 4-7 weeks to create and then ship; even longer if they are custom or if materials need to be special ordered. And the rush charges that need to be applied as it gets closer to Derby Day start adding up quickly. My suggestion is to start your pursuit of your Derby hat now. Then, on Derby Day, you will be ready to enjoy the 140 year-old American tradition of horse racing, hot brown sandwiches, mint juleps and gorgeous hats. Just remember that on Derby day it’s all about you and your hat; you are the master chef, the creator of your feast with your pièce de résistance chapeau carefully chosen and fit for a queen. Plan well, and savor the experience! Please enjoy these images of some of my lovely Derby ladies from previous years in their Derby hat splendor. For more photos please visit my Photo Gallery at www.maggiemae.com. To view the 2014 Kentucky Derby hats available at MAGGIE MAE DESIGNS® please visit the Derby Hat Collection and browse all four Derby hat salons for a wide variety of delightful hat styles from which to choose!